Some companies reinvest the amount for further development; some may buy back their own shares while the remaining rest would actually pay you the much-desired dividend. Investment options that pay back high dividends are things every investor desires. But, not all companies pay you dividends. Some companies reinvest the amount for further development; some may buy back their own shares while the remaining rest would actually pay you the much-desired dividend. But, are you aware ofthe cases where certain companies offer a high amount of dividend stocks? Though exciting, such offers can be too good to be true. You must be alert while having such lucrative high dividend stocks in your portfolio. After all, not everything that shines is gold. The sound of having your stocks pay you back a high dividend is highly attractive. Who wouldn’t want more money? Ramesh did the same. For 3 years in a row, Ramesh had been smiling at the rich quarterly returns he would get on his stocks. Such was his excitement that Ramesh ended up purchasing more of that company’s stocks. Tragedy struck when the company suddenly quit all kinds of dividends and abruptly saw its stock price plummet to an all time low. Ramesh, unfortunately, couldn’t identify the true nature high dividend paying stocks. One thing has to be noted: percentages do not speak for the actual figures. Take for instance the cases of Company A and Company B. Company A has a share price worth Rs 50 and it offers a dividend of about 1%. On the contrary, company B has a share price worth Rs 5, but it offers a dividend of 10%. 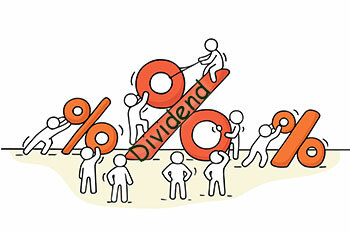 Calculating, the dividend paid by both the companies comes to Rs 5. This example signifies how one should not feel excited just by seeing the company’s dividend rate. High dividend stocks are lucrative for only one reason: quick returns. If you are an energetic and enthusiastic investor with a zest for quick returns, high dividend stocks provide you with unparalleled quarterly returns. But having said that, one should realize that a company has to be capable to pay its customers such high dividends consistently. Let us consider the case of Company B. Company B could not meet its dividend target this month due to various reasons. Apart from the reduced dividend, think of the possible ripples it could create in the market when consumers come to know about the company’s inability to pay the same or higher dividend. This will result in thefurther dropping of share values, something that isn’t favourable. High dividend paying stocks are volatile in nature. It depends on the profile and reliability of the company. One should keep this in mind: lesser the returns, higher the security and vice-versa. While investing in High Dividend paying stocks, one has to set a stop-loss, according to their capacity, in any event of a 50% drawdown. It is always recommended to update yourself with the company policies and track the ongoing market trend. Don’t buy stocks on their promise of high dividends but research well about the stock and the company offering it before investing.